This is sometimes counter productive to the true reason behind most game design. We want to create an immersive environment which the user enters this fantasy and is compelled to stay within the circle. This isn’t always possible with mobile games. Trying to force a user to stay within this circle and never break out is an uphill struggle. The major restraint with working with mobile, is that it is in fact… mobile. They may not be sitting quietly in a chair, at home with minimal distractions playing your game. You can’t design your game around this ideal circumstance. You have to create that immersive environment so that it wraps neatly around the player’s day to day activities. You have to design your game with distractions in mind. 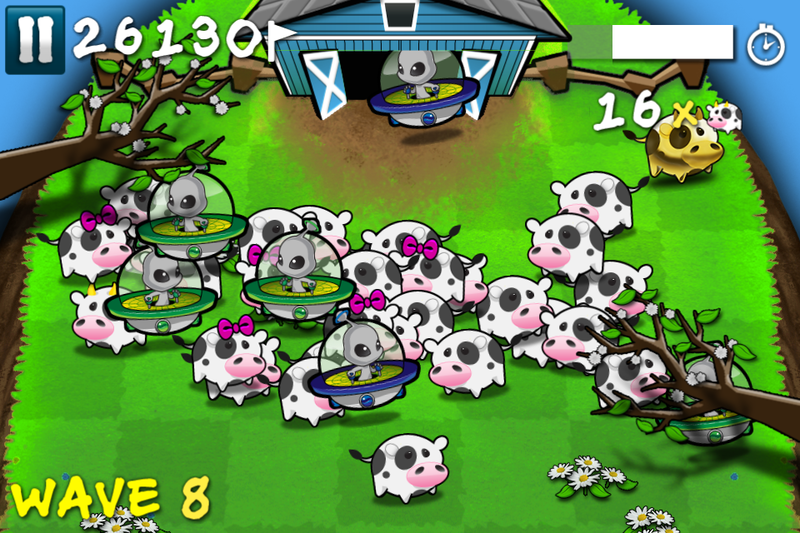 Mobile Game Design must account for a player with distractions. Specifically when they come back into a game. 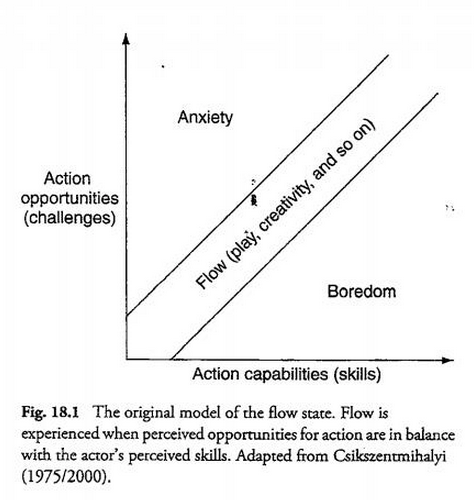 It’s all about managing a player’s flow state, and bringing them back into the “flow channel” (the balance between boredom and anxiety, building up their skills over time) as quickly as possible. Immersion is still very possible in this mobile environment, but it takes on different forms. You have to design your game in such a way that at any time the user can leave, come back and still understand what it is they are supposed to be doing. Dealing with distractions also means catering to your audience. You have to design game mechanics that adapt to the player’s life style. If your target audience is casual, then they have a smaller average session length then a core gamer. You have to design your game mechanics around getting your player in and out of the game within that average session length. They need to be able to get in, reach a high value part of the game quickly, then have the opportunity to leave without pain. Taking many cues from casual games, it is important that you design with intermittent play in mind. Building a mechanic that allows the player to quickly enter the game. A game design that enables the player to quickly understand the game state as soon as possible. Building a mechanic that allows the player to leave at any moment is imperative. You can’t assume the player will stay in your game for very long, life will usually take priority over playing a game for the player. It’s important to not disrespect your players at this point. A great game will create a lot of depth and strategy while keeping within these constraints. Many games on the AppStore will dumb down their concept for mobile to a point that it lacks depth. As always, it is important to understand and know who you’re targeting. 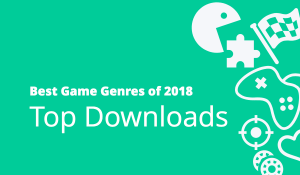 If you’re targeting core gamers and want to introduce a lot of complex depth in the gameplay, then you can expect that your user base will be more likely to have higher play session lengths and minimize distractions. Games are higher priority for them (then life). But even core gamers have distractions — and allowing them to play with depth while balancing these distractions will create an immersive game. Phone calls, texts, life will get in the way of your game — so make sure that your game can adapt to the player’s distractions. Easy In is about having an appropriate strategy for your player’s when they return from distractions. When the player returns to the game they should have as few clicks/steps as possible to return to the optimal game flow (the most exciting part of the game). The ideal design for a mobile game handling distractions is for the player to be able to exit the game whenever they want, and upon returning they are returned to the exact state they were in. Games that are turn-based can execute on this very easily. In a typical turn-based board game each turn has infinite time. So in the event the player leaves because of a distraction in the middle of game, has unlimited time to get ramped back into the game. The game would return right to game board, where the game’s optimal flow takes place. The player is quickly shown the game’s current state (the entire game board) and can easily think through their move. This is the ideal, since the gameplay is simple enough that the game state can be shown within one screen (the board) and the player has unlimited time to make the choice. Casual Games like Bejeweled do this well : even with a more arcade mechanic, each move the player makes has unlimited time for them to do so. This allows the player to put down their device, not worry about pausing the game, and return without worry. When returning, they can quickly understand the game state (all the jewel placement) and make a move at their leisure. Angry Birds, Cut the Rope and Where’s my Water all have unlimited turn times for a very good reason. The player can return to the game from distractions and reach optimal game flow as quickly as possible. Sometimes a player will need a little nudge. You want them to return to the optimal game flow as quickly and delicately as possible. So if the player just can’t spot the next move quick enough, it may be a good idea to “nudge” them to the right answer, so they can get back into the game quickly as possible. Bejeweled does this nicely. When a player hasn’t responded to the game in a few seconds, they add a nudge to show the player where a move is. Sometimes this can be disrespectful and insulting to the player, so use with caution. As always, understand your audience and decide how best to nudge without insulting their problem solving skills. This ideal situation does not work for all games however. If your mechanic requires the player to make very quick responding moves or make a move within a specific amount of time, then a player coming back in the middle of a game move will cause panic. This isn’t the optimal game flow state. The casual player will panic. In arcade games, creating unlimited timed moves would absolutely kill the nature of the game. Timing, speed and panic are the core components of these games. So how do we ramp the player up quickly? Well a naive solution is to cancel the previous game session they were having. When a player returns from a distraction, they must start from the beginning of the level. This is possible if your game sessions are 20 seconds or less. While the player will feel frustrated their 20 seconds of effort was wasted, this is a minimal punishment… but is still punishment. The other solution is a pause menu. 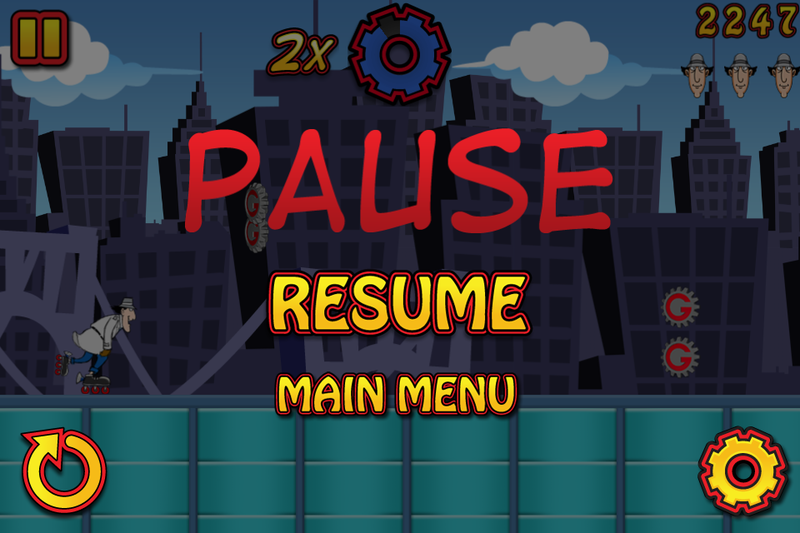 The player is able to pause the game at any point in the chaotic gameplay. This isn’t new. There was a reason why home console games had the “start” button in all games do this. I’m sure most parents would never had bought consoles for their kids if the pause button wasn’t invented. Many dinners would be skipped without pause menus. It’s important to use the pause menu for a real purpose. 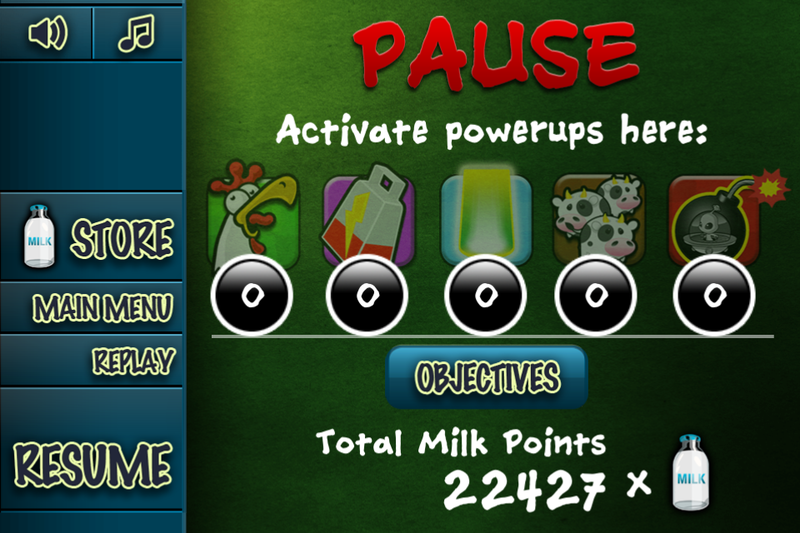 Cows vs Aliens used the pause menu to display briefly the game state (the player’s points, wave) and give them opportunity to trigger powerups. This doesn’t help the player return to the optimal game flow at all. ⦁ Instant panic as the game snaps back to the game, there are aliens headed towards the barn. ⦁ As a casual player, they don’t respond in time, they don’t have enough time to get back into the game flow. ⦁ Navigate the main menu to restart the game. This is just an example, but in this case it would have been better for this player to just restart the whole game and start from the beginning again. The player wasn’t able to ramp up quickly enough, and because of that it took 6+ steps to get back into the optimal game flow, with a few steps making them feel inadequate of playing the game. Some players would drop out by this point. Instead, allowing the player some ramp up time would be more ideal. Notice in Inspector Gadget’s Mad Dash, the pause menu is transparent overlaying the actual gameplay. This is essential. Immediately when the player returns to the game, they can see the game state, can take their time, take a deep breath, then plunge back into the game flow. Just this basic design decision makes a massive difference in how players can come back into the game. In the event that the game is much further down the track, the player has a difficult jump to make, or returning to the game would cause a game over, the player can predict this when returning, and at least make the decision whether to give up and try again, or try it out. At least they are aware of their fault, and will try to fix it next time they get a distraction. Taking this a step further, it’s important to nudge the player into the mechanic on a return as soon as possible. For more casual audiences, it may be more important to change the mechanic when the player returns from distraction to ease the player back into the mechanic. In an arcade situation, slow down the generation of obstacles, slow down the gameplay, and gradually speed the game back to its original state. Of course, close attention to exploits is important. You don’t want your player to use the pause menu to make the game easier. Management games, which involve the player managing their time, their town, their bakery shop, their pet shop, have challenges with managing easing a player back into the game play. In a game like FarmVille, it can be overwhelming for a player when they come back into a game to understand what they should be doing. They have to water their crops, plant new ones, gift their friends, add more friends, purchase that new item, there’s that sale on that barn… do I need it? etc. etc. etc. It can be a bit overwhelming. 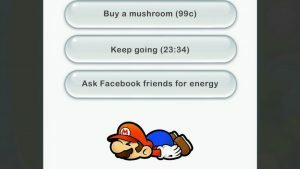 Especially as you add more steps and concurrent tasks to the player. Hyper-engaged players will not have a problem navigating this ocean of tasks, but many casual players, which you want to slowly ramp up to being more engaged can walk away when they are presented with so much choice. In this case it’s important to think of how a returning user can be quickly ramped up in the game. The optimal player flow is for them to work through a step by step process, doing each of their required actions, then leaving the game. But that’s not fun. That’s too restrictive and requires no thought by the player. However, you can help the player organize their required tasks in a convenient list, and allow them to opt-in to following the list of steps in whatever order they choose. When the player returns to the game, allowing them to press a button, or automatically bringing up their task list is a good idea. Each task should be a bite sized chunk of gameplay (collect all your plants, build a building, etc.). You can include some long term goals which require multiple sessions, but its important to hide these or allow the player to see them only when they’ve completed their short-term bite-sized goals first. Making these bite-sized and manageable within a few seconds allows the player to be nudged back into the core gameplay as soon as possible. It gives them a sense of accomplishment, and pushes them forward. 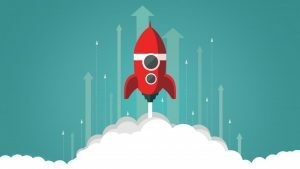 Prioritizing quick wins over long-term victories is a great way to motivate people and to create habits. Some games will restart the entire game from scratch every time the player opens the game. This is a terrible idea. While this will simplify the game start-up : the player will immediately understand what they need to do to continue (press play, start game from scratch) it clearly means that the game isn’t built with distractions in mind. If the player has to back-track and repeat more then a few steps of work to get them back to the game step they were at then this is just frustrating. If your game can’t adapt to a player’s life then a player won’t adapt their life to play your game. The only time which “restart completely” makes sense is when the player’s necessary steps to reach optimal flow is less if they just restarted from the beginning. Easy out is all about making sure the player feels no remorse for leaving the game. A big part to make sure this happens is having a good strategy for their return. Allowing the player to leave whenever they only works if the player knows that when they return it will be easy to get back into the game. It’s also important to find ways to add hooks to the game so that the player has clear areas of the gameplay that they can leave without feeling like they are going to be punished on their return. Classic arcade games and the original console games were terrible at this. If you ever had to shut down your console, leave the arcade machine, you knew that your game state would be lost forever. The day your parents accidently unplugged your Nintendo console while you were in world 8 of mario surely caused scarring effects on your psyche. The day that you wrote down your MegaMan password wrong, and ended up back at the beginning made you throw the controller through the wall. With mobile, we’ve evolved. We have far better solutions to this. Make sure your game does this as well. Easy Out is making sure that the player feels no remorse leaving the game flow. They can leave the game flow as often and as quickly as they need to. The biggest rule of easy out, is making sure there is no penalty for leaving. This includes making sure that when they come back their difficulty does not spike. This happens inadvertently many times. Pausing during an intense arcade game will put the player back in the middle of the fray, this time without time to react to the game. This spikes the difficulty and punishes the player for leaving. Makke sure the game has an effective easy in strategy to manage this punishment. Some games will pull the player back in the game allowing them to ramp up in the game easier. This is great to ramp up the player but has to be balanced with feeling like a punishment for leaving. The other important idea for easy out is to make sure you have plenty of “coffee breaks”. Every so often, the player should be able to take a break from the intensity and feel “OK” with leaving. Counter-intuitive when you want to create an immersive environment, but it depends on how you portray it to the user. You want to try to influence the player so that they leave at good areas of your game. This allows you to better design their return. In an arcade platformer game, It’s better for a player to stop playing your game between levels, than during. If a player exits your game during a level, they are far more likely to return to the game at a point that will confuse them. Having “safe zones” as often as possible allows the player to return to a point in which you as a designer can ramp them up as smoothly as possible. If a player feels like the next coffee break is too distant in the future, they are more likely to exit the game in an awkward area, then when you intend them to. ⦁ Have access to reference for information they are required to remember from previous sessions.